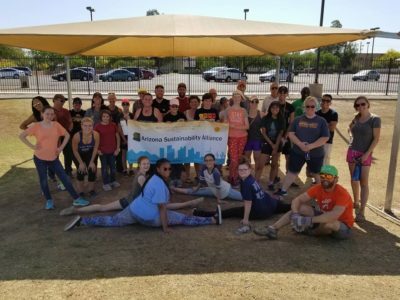 To engage our volunteers in projects that sustainably contribute to increasing urban forestry in Arizona and to educate the public on the benefits of urban forestry, including carbon capture, decreasing the heat island effect, and cleaning the air. Right now, the West Valley is seeing a lot of growth and the cities are actively engaged in increasing their sustainability as they continue to grow. We are exploring the possibilities of doing plantings in cities like Glendale and Buckeye to aid them in these efforts. Both of these cities have great need for more trees and are interested in increasing their canopy in a sustainable way. Planting trees in growing areas like this can help these cities set themselves up to fight air quality issues and the effects of climate change. We are creating a self-sustaining nursery that will create a micro-forest environment in an urban setting. The nursery will support a program for students, starting in about second grade, to regularly come to this outdoor classroom for education on trees and their ecology. This program will teach students the importance of trees and how to care for them, while supporting their mental health by providing regular retreats into a forest environment, which studies show provides numerous benefits. We are currently developing a tree planting project in Guadalupe. According to a shade map created by the Arizona Department of Forestry and Fire Management, Guadalupe is one of the areas in the valley most in need of additional shade. We are currently getting to know the area and looking for a location that would like to work with us. We are currently in conversation with the city government in Apache Junction to determine their current urban forestry goals and plans to see where we can add to their efforts. We are currently working on creating our next planting in Tempe with the North Tempe Neighborhoods Association. Currently, we are working with the HOA group to determine interest among the residents, ideal location, and other project design details. The North Tempe Neighborhoods planting will also support the Tempe Urban Forestry Master Plan and will be funded by the rest of the urban forestry grant we received from International paper. On April 28, 2018 we planted 19 trees at the New School of the Arts and Academics in Tempe. We worked with the school, specifically teacher Jane Dowell, to provide trees in areas that could use shade around the school. Jane plans to utilize the trees in future classrooms to teach children about trees and have them help take care of the trees. This project was part of our efforts to support the Tempe Urban Forestry Master Plan, which calls for increasing canopy cover to 25% by 2040. As the City only owns less than 3% of the land in the City, most of the planting will have to take place on private property. The trees will provide shade in much of the outdoor area the school has, including near some of the classroom buildings, which will help keep those buildings cool. By planting desert-adapted trees like eucalyptus, desert willow, and palo blanco, we have limited the amount of additional water the school will have to use to support the trees in the future. This project was completed with an urban forestry grant from International Paper. by Aubrey Coffey-Urban New School Tree Planting Thank you to everyone who came out to the first tree planting in our Urban Forestry program at the New School for the Arts and Academics in Tempe!